:D As I add more features, there should be ideas on what we can add in Rygel to make use of this. There’s a UPnP/DLNA standard extension (CLOCKSYNC or sth like that) I have kind of an umbrella ticket open at https://bugzilla.gnome.org/show_bug.cgi?id=757681 where I started gathering random resources, not sure how this all fits together in the end. I’m building a videowall right now that could have used this. Some things to solve: handle disconnections and reconnection gracefully (and handle gstreamer clock – not something I’ve looked into yet). since it might take 150ms or more to get across Wi-Fi, you need to know what to play next before the current item has finished playing. For images you need to know how long to display them for, since they eos immediately. Transformations – for a videowall each screen can display a part of a larger virtual image. So the first two things I’m looking at after some API cleanups (that are more or less done now) are two things you mention — playlists, and transformations. Images should be relatively straight-forward to add on top of this (I’ll add it to the TODO). Connection/disconnection is handled gracefully — a client can turn up at any time and be in sync. The server deals with clients going away fine too. I also want to be able to deal with dynamically updating client transformations based on this (which I intend to have from the get-go while implementing transformations). Not sure what you’re referring to with regards to the GStreamer clock. Let’s say audio and video come from different servers, but both streams should be played in sync. Have you considered syncing playback in a setup with multiple servers and multiple clients? It shouldn’t be too hard to add the metdata into the control protocol to enable this. How accurate and fast you are gonna to be? In my case, i have amount of devices (>10) on a field. Some of them are wired. Other are wireless. They have different meaning: video source, audio, information providers, event registrations. All should be synchronized in a milliseconds. Will you handle time sync, delays, timeouts, watch dog, wrong packet order,…. If it is so, we can to start work together on this library. Or it is not your scope? The framework I’m building should allow you to do all this — I’ve seen sub 5 ms (worst case) sync on pretty terrible hardware over wifi, so the degree of synchronisation should be easy enough. My plan to do multi-room is make it generic, so that you can have client groups, and each group can have its own stream. This should fit what you need for clients to be able to play different things. Delay, timeouts, watchdog, packet order etc. 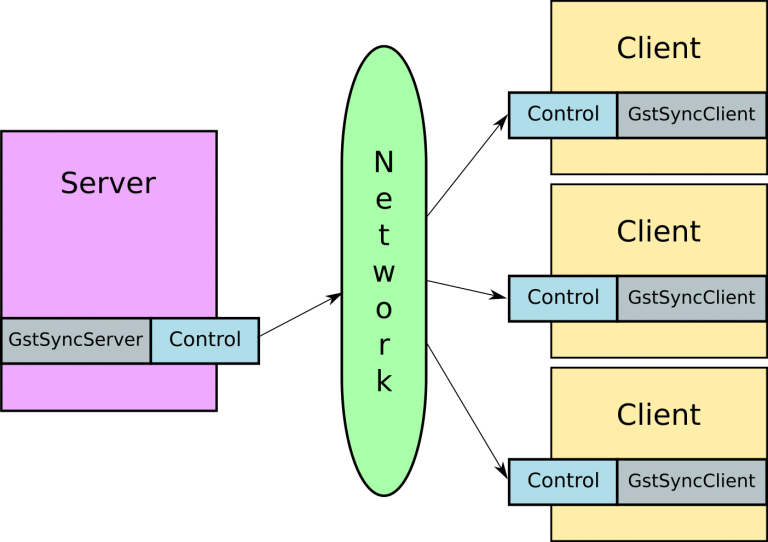 are dependent on the transport, which is pretty much a plug-what-you-want mechanism, with a default TCP transport which at least takes care of packet order. Contributions are welcome, of course!